It’s not surprising that City Councillors are often in the news, offering comment, explanations, and other thoughts on the latest decisions and issues. Some are generally in the news for positive reasons, others, not so much. 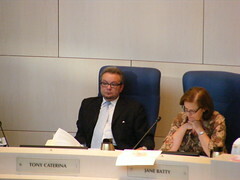 Ward 3 councillor Tony Caterina is one of the members of council who seems to be mentioned for negative reasons more than positive ones (thanks to Dave for the photo). I mean, he’s even got his own hashtag on Twitter to track all of the bizarre things he says and does! I thought it would be interesting to take a look back at Caterina’s quotes throughout 2009. Ideally I could just point you to his voting record online, but we’re not there yet, so quotes will have to do! A note on the data: I decided to make it simple and to only look at quotes from the Edmonton Journal. I searched the Canadian Newsstand database (anyone with an Edmonton Public Library card can access it for free) for “tony caterina” in the Edmonton Journal for any date in 2009. A total of 71 articles were found, up to December 3rd. For each one, I looked for direct quotes. I also added some quotes from articles written after December 3rd. And here, by subject, is a selection of Tony Caterina quotes on the issues in 2009. You can download all of the quotes I found here in PDF. "We’re talking about closing aviation down, and businesses, and putting people on the unemployment line. Really, that doesn’t make sense." "In regards to economic development, it’s critical … here we are contemplating getting rid of something that’s already here. That just doesn’t make sense to me." "If we’re not going to talk about the possibility of improved aviation service, what are the possibilities? From our perspective on council, we will want to push for that to be part of the debate." "It’s not a cost, it’s an investment into promoting Edmonton as a world-class city. We made a decision as council to support this event because it is world-renowned … Given the exposure we have had, it’s money well spent." "The publicity, you can’t even put a price tag on it. The Indy is being seen by countries around the world." "The prudent thing would be to get a…firm commitment from the province and the federal governments (that) if this bid is successful, they are prepared to support the $2.3 billion." "We have gone all year asking administration to work on this budget, three per cent (plus) two per cent for (neighbourhood) renewal. They have certainly done that. It’s a very fair budget to everyone. If we don’t accept this recommendation on this after a full year’s work, then going forward from this, any time we ask them to do something, where’s the credibility?" "The pedway system is there. Certainly, we’re not going to get rid of that, but there probably needs to be better planning for the buildings that are going up. The main floor has to be commercial, more so. They should be concentrating on getting merchants back on the street so people have a reason to be outside, and not just in the pedway system. To bring people back on the street, you need something for people to attract them -clothiers and shoe shops." "They make everybody else look bad. The majority in the…industry are good operators, but you have the few who, they can’t comply or won’t comply." "I don’t know what it is about me, I’ve always denied that I like cats but I’m always the first one they come to." "When it’s a cat involved, there are more people saying ‘just keep Fluffy, I’m not paying 250 bucks for it. It seems dogs have more value." "We’ve been so far behind in infrastructure repairs. The more we can get done, the better. There are a little sharper pencils putting the prices out. This will help go a long way to making sure we come in with a very very reasonable tax rate for next year." "There’s enough residual benefits, from (lower) carbon dioxide emissions and fewer vehicles…We subsidize (student) tuition, we subsidize transit, we subsidize all kinds of things, but they’re an important group." "Even with the system that we have now, you’re running against each other. There’s always a chance that one incumbent, as happened in the last election, or both, could be defeated. I don’t think that’s an issue for consideration." "There’s a limited amount of money and we have to look after higher priorities. Edmonton already has a lot of paths for a winter city — about 1,000 kilometres of bike trails and roads — so I think we’ve done a good job." "How many members, how many panels, do we need? We might as well just ask the public where to put the money. That’s a big part of the councillor’s responsibility. It sounds good to have public involvement, but at the end of the day that’s what council is here for." "All it’s going to do is pit neighbour against neighbour. I would have to agree with my constituents that have phoned in to say this sounds like the silliest thing we have done here in a number of years. I think this is a little excessive. People in general are good. They understand the environment and will do what they can in order to mitigate their contribution to … pollution." "A number of bloggers — who knows where they come from — are treated as gospel." As you can see, not all of the quotes are negative. As an aside, I think Scott McKeen wrote more about Caterina than anyone else this year. He must love him 😉 In quite a few articles, Caterina is mentioned as the only councillor to vote for or against something. He likes to be different, I guess! I couldn’t find a quote, but earlier this year Caterina said he worked longer hours and spent fewer nights at home when he worked in the private sector. That’s no surprise though, as Caterina apparently likes to get out of his duties as a city councillor. Anyone else looking forward to more fun with #toncat next year? Election day is October 18, 2010.